As Spring 2019 , we take a few moments to remember our past, as this does help shape our future! Tom and the team at Grosh's Lawn Service for ten (10) years maintained the on and off ramps to I-70 West here in Clear Spring Maryland. Being a part of the community means giving back to make your community a wonderful place to live and raise a family. How can Grosh's Lawn Service help you with your lawn and landscaping here in the Clear Spring MD area? 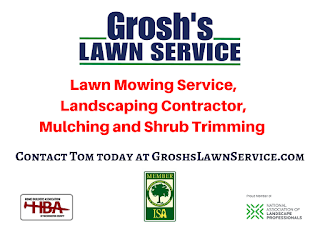 Contact Tom today at GroshsLawnService.com to schedule your lawn mowing service, lawn care treatment program, shrub trimming, mulching and landscaping design build consultation here in Clear Spring MD and Washington County Maryland.